Closing a sale does not just happen at the end of your sales process. It happens throughout your sales process. 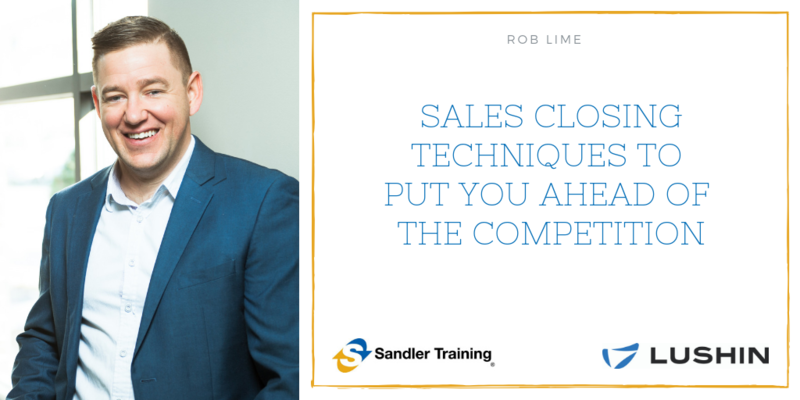 Knowing how to position yourself as a consultant, not just a salesperson that is an exact replica of every other salesperson your prospect sees, will lead to closing more sales - and closing them faster. There are books, blogs, and seminars dedicated to teaching eager sales people how to “counter” or “handle” their prospects’ objections. What this strain of sales theory doesn’t account for is that there are only two types of responses when a prospect objects to you: you’re either being defensive, or empathic. And any move to “counter” or “handle” objections is a defensive response. Your first “move” when dealing with a prospect’s objection should be to invoke a feeling of gratitude. Think it through – we spend so much time working so diligently to get prospects to share their thoughts and feelings with us openly. And when they finally do, our reaction is to become argumentative and tell them why they are wrong. At the moment they object, they are bringing you into their thought processes, belief system, and thinking paradigms. A strong, consultative sales person can work miracles with this information. Leave the argumentative amateur in the car. Be a consultant instead. Picture the last time you told a salesperson “no.” What happened next? Did he or she go quietly away? No, of course they didn’t. What happened next was that you were on a sales call (and likely an argument) you didn’t want to be in. You’re not alone in this life experience. For their entire lives, your prospects have been treated like this by salespeople as well. And they assume, through no fault of yours, that you are the same way. Sales prospects are terrified to tell us the truth, their real objection, or what they are really thinking. Why? Because they’re not interested in the argument. But what if they truly felt comfortable telling you “no”? If they knew that a “no” answer from them would result in you packing up and going home? If these were truly the circumstances, they would feel comfortable telling you anything. So give them permission to tell you “no”! You are the best chance your prospects have at working through what’s in between them and making a decision to buy you - to you closing the deal. You are the expert in what you do and sell. You are the one with the wealth of experience with the product or service you sell. Your prospect’s best chance at making a good decision is with your input. Them brushing you aside to “think about it” or “consider their options” or have a conversation with someone who, up to this point, has been totally detached from the buying process just isn’t the best way for them to decide. You owe it to them to be useful in their decision process. And any thinking, talking, comparing, or deciding they do when you’re not in the room is (of course) bad for you, and very likely, bad for them. A "think it over" excuse comes in 1,000 different packages. Sometimes it’s “let me think about it,” sometimes it’s “let me talk to your competitor,” and sometimes it’s “let me see what my dog-walker’s rabbi says about this.” But they’re all the same (bad) excuse. So give your sales prospects a hand. Help them figure out why they’re unable to make a decision. Ask the next, right question. Your credibility shoots through the roof. The prospect becomes more comfortable. And the 5% of the time that they tell you “you’re right, it’s a 'no',” I’ll take that answer too. Because that answer was coming, but now I get a rebate on a very precious asset – my time. In the “why do it” business, apathy can be your biggest competitor. Most of the time you’re not losing sales to a competitor, you losing sales in favor of the prospect taking no action. In the “why do it with with me” business, your competitors are typically your greatest competition. You are losing sales to prospects taking action with another company. Regardless of which type of business you’re in, how often do your prospects tell you exactly how important it is to fix their problems and that they are completely committed to the solution no matter what? In the “why do it” business, a commitment step before closing eliminates the competition. Doing nothing isn’t an option to prospects who are committed to taking action. In the “why do it with me” business, a commitment step also eliminates the competition. If they are committed to solving whatever pain your marketplace differentiators solve, hiring another isn’t an option. Looking for a sales consultant to train you and your team on sales closing and other effective techniques that increase revenue? Connect with a Lushin sales trainer! We have years of experience training salespeople to grow their sales. Find out how we can make a difference for you and your team when it comes to developing effective sales skills. Contact us online or give us a call at 317.846.9200 to get the conversation started. Interested in resources that can help take you to the next level? Check out our downloadable sales training white papers and our extensive collection of sales training videos for valuable sales insight from our team!